This is a classic bistro salad that is a particular favorite of the Accidental Locavore’s husband and her father. A poached egg is the traditional accompaniment. I usually eat mine without as I have an old abhorrence of runny egg yolks, but I’m told it adds that certain je ne sais quoi (f you need help poaching the eggs, click here). It’s quick to make and is a good winter salad. The Accidental Locavore salad frisee lardon recipe. A classic bistro salad recipe with frisee, bacon and a poached egg with a vinaigrette dressing. If you are poaching the eggs, start them first. Heat a small sauté pan with a tablespoon of oil over medium heat. Add the bacon and cook until the fat is rendered and the bacon is cooked but not crispy. Remove the bacon and drain on a paper towel. Reserve all the fat for the dressing. In a small bowl or 1-cup measuring cup, add the shallot, mustard, salt and pepper, herbs de Provence and red wine vinegar. Slowly whisk in the bacon fat until the dressing starts to emulsify. Taste and adjust olive oil and seasonings as desired. To construct the salad: Place the frisée and bacon in a large bowl. Add the dressing and toss to combine. On individual plates, put a mound of the dressed frisée. Top with the crumbled blue cheese and a poached egg if using. Serve and enjoy! My verdict: This is a great salad that I don’t make enough! 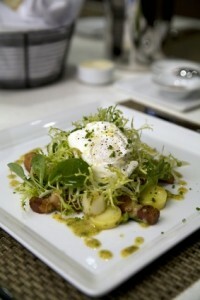 If you see frisée in the market, give this a try. Mushrooms or walnuts, toasted and coarsely chopped are also a nice touch. 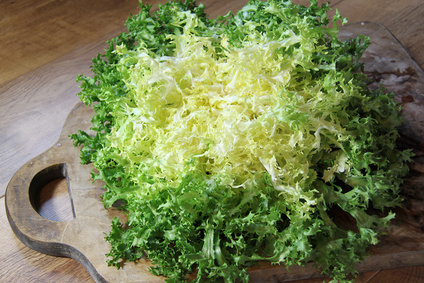 The frisée on its own is also a good side salad for rich foods like duck (confit) or fois gras. Previous post: Food & Drink Apps, Who Uses What?